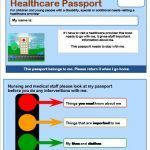 Creating a passport-style document for your child can be really useful for healthcare and hospital appointments as well as after school activities or emergencies. You can download a template and then personalise it with important information about your child or young person. It’s helpful for hospital staff, dentists, PAs and other people working with your son or daughter, and can include communication needs, support needs, medication, as well as things that are important to your child, their likes and dislikes. Pinpoint worked with parents and Addenbrooke’s Hospital to create an Additional Needs passport for children and young people attending the hospital. There are child and adult versions. We also have a general healthcare passport template. Use it at hospitals, clinic visits or GP appointments. Or keep a spare for holidays or one in the car glovebox in case of emergency. “My son had to have an operation at Addenbrooke’s hospital. He is on the autistic spectrum, so I prepared a hospital passport before our visit. The ward staff recognised the passport, welcomed it and read it and used it help prepare my son for what was going to happen. They noted from the passport what sort of toys he likes and brought these for him to play with while he was waiting. All of the ward staff were helpful, they all took time with him, making sure that he was happy with everything that happened. Use it for after school clubs or perhaps a school outing/visit. Share it with activity providers such as Girlguides, Scouts or family fun days, etc. With the passport you don’t have to repeat information every time your child goes to an event (you may be asked for additional information from the activity provider i.e. permission to take photos). The Passport is for families with a child/young person up to age 25. You are entitled to a Passport if your child/young person is enrolled on the SCIP Database and has a disability or additional needs. If you have any questions please contact the SCIP Co-ordinator Joan Adamson. 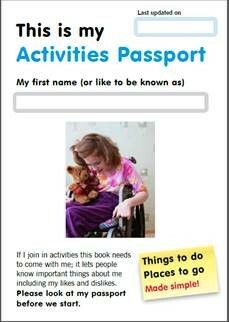 Here’s an example of a Communication Passport or a “One Page Profile” Word document that can be produced by parents and carers to give a clear, person-centred description of their child or young person with SEND. It helps anyone working with them to understand their needs and strengths and what helps them, say, at school. It can be useful to give copies of a pupil’s passport or profile to new schools, new members of staff etc., so that they can get a quick and easy-to-read basic profile of a pupil. You can customise it to the needs of your child (the boxes on medical needs or self-help needs, for example, can be removed). It can also be adapted for older children or young people.